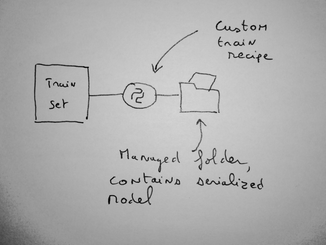 In addition to standard models trained using the DSS visual Machine Learning component, the API node can also expose custom models written in R by the user. To write a “custom R prediction” endpoint in an API node service, you must write a R function that takes as input the features of the record to predict and that outputs the prediction. The custom model can optionally use DSS managed folders. This managed folder is typically used to store the serialized version of the model. The code for the custom model is written in the “API service” part DSS. To create a R Prediction endpoint, start by creating an API service from the API Designer. To create a custom model, you need to write a single R function. When you create your endpoint, DSS prefills the code with several sample functions that can all work as a R prediction model. The function takes named arguments that are the features of the model. You may use default values if you expect some features not to be present. For the R prediction endpoint, you can tune how many concurrent requests your API node can handle. This depends mainly on your model (its speed and in-memory size) and the available resources on the server(s) running the API node. One allocated pipeline means one R process running your code, preloaded with your initialization code, and ready to serve a prediction request. If you have 2 allocated pipelines (meaning 2 R processes), 2 requests can be handled simultaneously, other requests will be queued until one of the pipelines is freed (or the request times out). When the queue is full, additional requests are rejected. Each R process will only serve a single request at a time. At a high-enough value to serve your expected reasonable peak traffic. If you set cruise too low, DSS will kill excedental R processes, and will need to recreate a new one just afterwards. But also at a not-too-high value, because each pipeline implies a running R process consuming the memory required by the model.